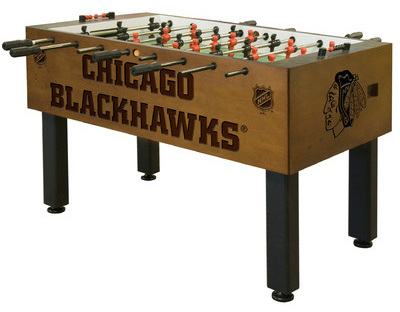 Looking for a foosball table that will let you represent your team? The Holland Bar Stool company teamed up with Olhausen Billards to offer this amazing table that can be custom inscribed on the sides with your team. They also make versions of air and dome hockey with these custom logo graphics. It goes great with your man cave if it is decked out with your favorite team's logo. Simply click on the Search For Your Team button to search for your favorite college and pro sports team on your table.